One of the mysteries of my Norwegian ancestry has been the question of the Bonn surname: how did it originate and from where exactly? 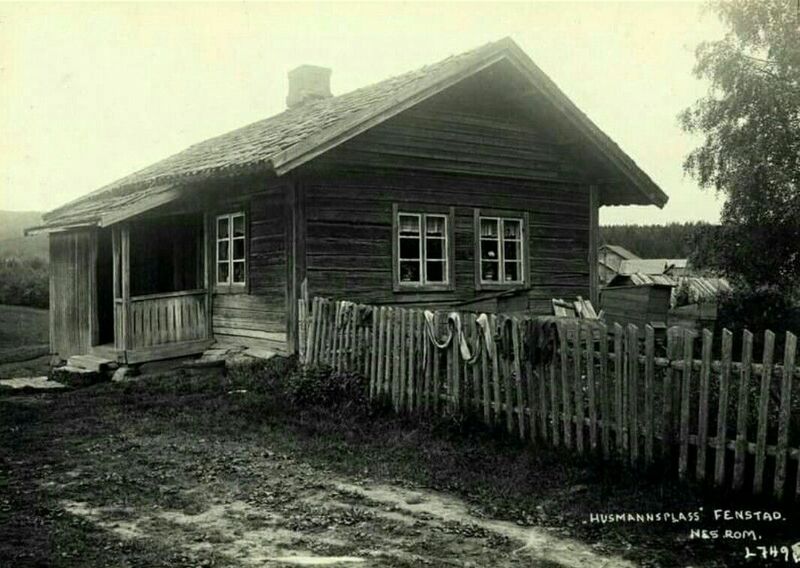 In Norway, the family name and location often go together, based on the old tradition of giving every farm a distinctive appellation, a “farm name.” Many farm names were converted to surnames in the late 19th and early 20th centuries, either when people immigrated abroad or when they were pushed to do so by society, and eventually the government. Both of my ancestral Norwegian surnames are farm names in origin. Our Aaberge ancestors lived in Sogndal Municipality, Sogn og Fjordane County; our Bonn ancestors lived in Eidsvoll Municipality, Akershus County. Background: My mother’s family has always known that their Bonn ancestors came from somewhere near the village of Bøn in Eidsvoll municipality, Akershus County. 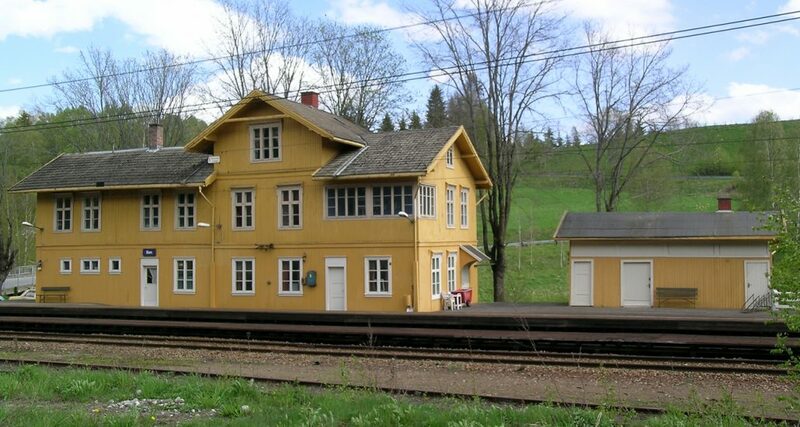 The featured image at the top of this post shows the train station at Bøn, built in 1874. (It is no longer a train stop but has been preserved for historic reasons.) Eidsvoll is famous in Norwegian history for being the site of Norway’s transformation from a monarchy to a constitutional state in 1814. There’s also a farm called Bøn right next to the village. The farm almost certainly preceded the development of the village. An important resource for genealogists is the compendium of farm names and etymologies produced a century ago by Oluf Rygh. It’s a mammoth 19-volume publication called Norske Gaardnavne (Norwegian Farm Names). Bøn is listed as Farm No. 138 in Eidsvoll, Akershus. It’s an ancient farm, with references going back as far as 1335. Living descendants of this family in America today derive from sons Bernt Olsen Bonn and Ole Olsen Bohn. Ole has living descendants in Illinois (and maybe elsewhere) with the last name Berg. From Bernt, my great grandfather, we have my mother and her siblings who still carry the Bonn surname or maiden name. In addition, one of their first cousins was given Bonn as a first name, and my brother and one of my sons have Bonn as their middle name. Our family never knew exactly why the family chose the Bonn surname, other than the connection to the name of the farm, nor did we know where our ancestors resided precisely. The Bøn farm complex is divided into many parcels, some of which have their own distinctive names. When my mother and her siblings visited Norway in 2000, she and her sister Susie drove to Eidsvoll and tried to research where the ancestral home was located. They found some information that indicated the family may have lived on a farm known as Bønsmoen. They reported this when they came back but always cautioned they really weren’t sure. The joke at the time was that we could easily have been named Bønsmoen instead of Bonn. In the past few years, as I delved deeper into Norwegian genealogy, I was unable to confirm the Bønsmoen farm name. The two national censuses of 1865 and 1875 actually confused the issue. The family is enumerated in the 1865 national census, but the residence is listed as Bohn Backs,s not Bønsmoen. Although this domicile is clearly a sub-division of the Bøn farm, the phrasing Bohn Backs,s is not seen anywhere else in any record. It could be shorthand for saying they lived on the “backside” of Bøn, according to one interpretation. As for the 1875 census, the family is unfortunately missing and may have been overlooked. Discoveries: I recently enrolled in a virtual Nordic ancestry course taught by the Salt Lake Institute of Genealogy. It was an outstanding course and I recommend it to anyone interested in becoming serious about their Norwegian heritage. Primary instructors Finn Karlsen and Jeff Svare are world-class in their knowledge of the subject. As a result, my research skills in Norwegian genealogy have advanced significantly. I am especially better now at searching and browsing in the Digital Archives of Norway (DA), the key resource for any Norwegian genealogical query. The most immediate result: finding new records which partially solve the question of the Bonn name. The records reveal that the Ole Larsen family did indeed reside at a sub-division of the Bøn farm called Bønsmoen. They were there at least 30 years: 1853 to 1883. What Beverly and Susan found in 2000 was correct. It’s interesting that Ole & Dorthea emigrated in May 1883 one month after their daughter Maren was married. Possibly they waited until she was well situated before departing. It’s unknown why the youngest child, Olava, did not emigrate with them. She was 18 years old and still unmarried. She subsequently married Hans Johannesen and had at least 8 children, beginning in 1888. Why did so many members of the family leave Norway? It was probably because the family did not own any land and had dim economic prospects. They were “cotters,” not property owners. A cotter is a tenant who occupies a cottage on someone else’s land in exchange for labor, similar to an indentured servant. The 1865 census, for example, refers to Ole Larsen as a husmann med jord. Husmann means cotter, while med jord refers to an arrangement by which the landlord allowed the tenant to maintain a personal farming plot. Some husmann contracts only provided a dwelling and some provided a small plot of land in addition to the dwelling. In our case, the family had such a plot. The 1865 census indicates the family had one cow and one sheep, and grew mostly potatoes, some wheat, and a small amount of barley. Cotter houses were often one-room structures. Some farms today still use these old cottages as storage sheds. This revelation places the Ole Larsen Bønsmoen family in a lower socioeconomic class. Cotters formed a significant portion of the Norwegians who emigrated to America because of their uncertain economic circumstances. The population in Norway nearly doubled from about 900,000 people in 1801 to almost 1.7 million in 1865. There simply was not enough farmland to go around and the husmann class grew significantly. Without ownership, the family had no permanent link to the Bønsmoen farm. Not only was the family no longer associated with that domicile after 1883, but prior to 1853 they could easily have moved there from somewhere else. In fact, the 23 October 1864 confirmation record of Martha, the oldest child, says that she was born 29 Sep 1849 at the Vengemøn farm. This likely refers to a sub-division of a farm complex spelled on most maps as Venjar, right next to Bøn. It is, therefore, possible that Ole & Dorthea first lived as a couple at a sub-farm of Venjar and then moved to Bønsmoen sometime between 1849 and 1853. This needs to be further explored. 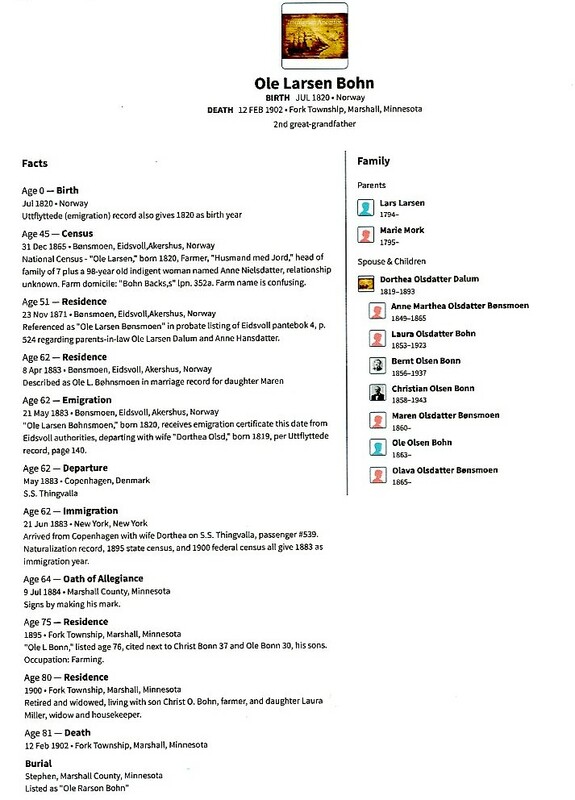 It would help considerably to identify where Ole’s father, Lars Larsen, was residing. I have started that process but have not made any immediate headway. There are multiple Lars Larsen candidates living in Eidsvoll between 1790 and 1870, his presumed life span range. He could also have been from outside Eidsvoll. Lars Larsen, like his son Ole, could have also been a cotter – or he could have been a landowner, but a different son inherited the farm, and Ole had to fend for himself. As a result of this discovery, I am changing the family tree to indicate that the family’s proxy surname prior to emigration was Bønsmoen, not Bøn. Although he became Ole Larsen Bohn in America, he was known in Norway as Ole Larsen Bønsmoen. Keep in mind that, technically speaking, Bønsmoen was not a surname. Norwegians did not adopt surnames until well into the late 19th century – except for certain categories of society (e.g., nobility, clergy, foreigners). It was not even legally mandated until 1923. Instead the Bønsmoen “name” is an address locator – as in, “I am Ole, son of Lars, who lives at Bønsmoen.” When someone moved to a different farm, they immediately were known by their new farm name and lost the old address. 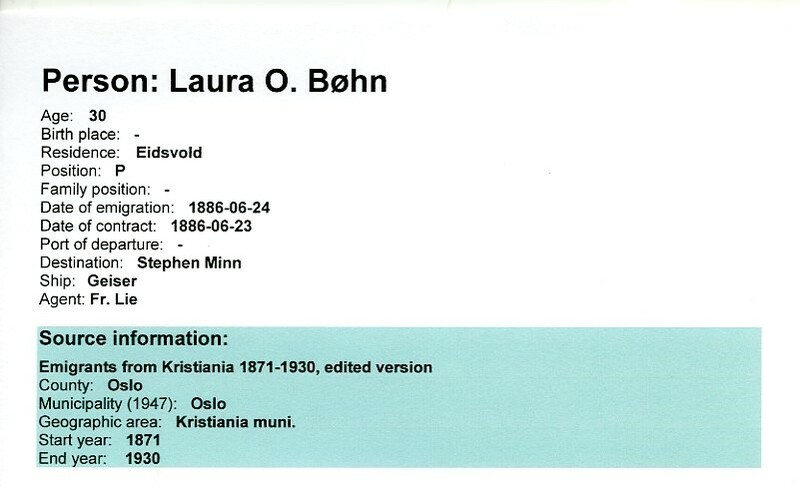 Therefore, the fact that all these records consistently cite Bønsmoen for Ole & Dorthea and their children is a significant indicator of their residence over a 30-year span. So the old joke about my mother’s family possibly being named Bønsmoen instead of Bonn turns out to be true. It could have happened, but they obviously opted to simplify the name. They could have just as well settled on Olsen, the patronymic used by the children, or even Larsen, the patronymic name of the father. What we still haven’t solved is the exact location of the Bønsmoen sub-farm. However, a breakthrough on that front is likely … so stay tuned! I am confident we will get it figured out. I have access to all the property and deed records for the Bøn farm complex in the 19th century and although it is all hand-written in Gothic Norwegian, I think I can eventually deconstruct our family’s location with some translation help. There are also some local farm-history books (bygdebok) which I have not seen yet.